A 65-year-old man (blood type O) came to our hospital for transplant of an unrelated kidney (6/6 mismatch of HLA genotype) donated by his living 60-year-old wife (blood type B). The planned right donor nephrectomy was uneventful, with a warm ischemic time of 5 minutes, but her right renal vein was too fragile and weak to be repaired for vascular anastomosis. Therefore, we used an artificial vascular graft (polytetrafluoroethylene) interposed between the donor renal vein and the recipient’s left external iliac vein. On the 11th day after surgery, infraphrenic free air (identified by a chest radiograph) made us do an emergent laparoscopic examination that showed a perforation of his sigmoid colon. A transient transverse colostomy was therefore prepared. The transient transverse colostomy was closed 8 months after the kidney transplant. Twelve months after the transplant, the patient is doing well with a serum creatinine level of 150.44 µmol/L (1.7 mg/dL). Immunosuppressive agents have made kidney transplant safer cases with ABO and/or HLA incompatibilities,1, 2 but there are still anatomic complications associated with a kidney transplant because the sigmoid colon can make the left iliac space deep and narrow. We encountered 3, rare, surgical and medical problems, occurring simultaneously during the course of kidney transplant: (1) was the necessity of venous reconstruction using an artificial vascular graft interposed between the donor’s fragile renal vein and the recipient’s left external iliac vein, (2) there was a sigmoid colon perforation after the kidney transplant that required immediate surgical repair under intensive immunosuppressive conditions and (3), there was donor-recipient ABO-incompatibility and 6/6 mismatch of HLA typing. Here, we describe the clinical course of this case, in detail, and discuss the complications we had to deal with in this kidney transplant. The recipient was 65-year-old man (blood type O) with end-stage renal disease. He visited Shimane University Hospital for transplant of a kidney donated by his living wife (blood type B). Routine serum examinations revealed the ABO incompatibility and HLA incompatibilities (6/6 mismatch of HLA typing). In addition, panel reactive antibodies were positive for class I and negative for class II. Preoperative desensitization included splenectomy, 3 courses of double-filtration plasmapheresis, and 1 plasma exchange. 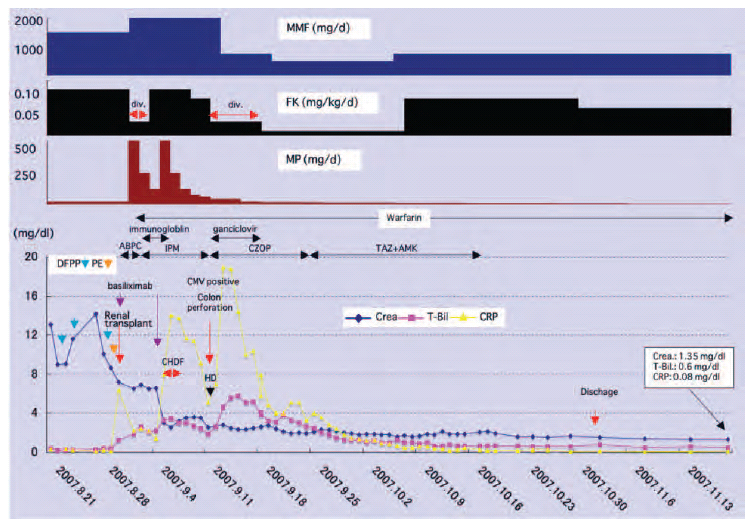 Immuno­suppression was done by oral FK-506 (0.1 mg/kg/d), oral mycophenolate mofetil (1500 mg/d), and oral methylprednisolone (20 mg/d) beginning 1 week before transplant. The final, preoperative, immunologic examination demonstrated negative panel reactive antibodies of both class I and II antigens. A preoperative computed tomography scan of the recipient showed intensively calcified plaques at the branching portion of the right common iliac artery and multiple diverticula in the sigmoid colon. Therefore, we decided to remove the right donor kidney and place it in the left iliac space of the recipient. The donor nephrectomy was uneventful, with a warm ischemic time of 5 minutes, but the donor right renal vein was short and its wall appeared to be fragile and weak. The fragile renal vein could be repaired in bench surgery performed in an ice slush. Venous anastomosis between the repaired donor renal vein and the recipient external iliac vein was attempted, but it was not possible owing to tension between the repaired renal vein and the external iliac vein during anastomosis, which resulted in further tearing of the renal vein. Therefore, we decided to interpose an artificial polytetrafluoroethylene vascular graft between the renal and the external iliac veins. Total ischemic time was 4 hours 25 minutes. (Figure 1). Persistent elevation of blood urea nitrogen and creatinine 11 days after surgery led to transient hemodialysis therapy. A chest radiograph showed infraphrenic free air, indicating that there was a perforation in the gastrointestinal tract. An emergent laparoscopic examination revealed a pinholelike perforation in the sigmoid colon around the critical point of Sudeck. A transient, double-barreled, transverse colostomy therefore was constructed. After that, kidney function and the patient’s general condition were gradually restored with negative conversion of C-reactive protein (Figure 2). A computed tomography scan 46 days after the surgery showed that the hematoma around the artificial vascular graft persisted with no signs of infection (Figure 3). The transient, transverse colostomy was closed 8 months after the kidney transplant. One year later, the patient is doing well and has a serum creatinine level of 150.44 µmol/L (1.7 mg/dL). The characteristics of this case include essential issues that should be borne in mind when a patient is undergoing a kidney transplant during the era of newly developed immunosuppressive therapy. 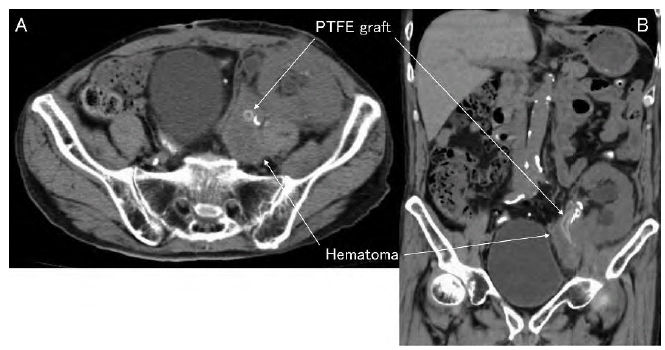 This case not only required intensive immunosuppression but also had potential anatomic problems related to placing the donor’s right kidney, with a fragile renal vein, into the deep left iliac space of the recipient that required use of an artificial polytetrafluoroethylene vascular graft for venous reconstruction. It has been reported that if the right renal vein is short or fragile, then the kidney is positioned inverted in the recipient, and the renal vein is placed posteriorly, adjacent to the external iliac vein, making it as safe and simple a venous anastomosis as possible.3 In the present case, however, because the recipient showed intensively calcified plaques at the right common iliac artery, we did not position the kidney upside down in the right iliac fossa, but placed the kidney conventionally in the left iliac fossa. Colon perforation is fatal in about 2% of kidney transplants.10-12 Its most common cause after kidney transplant is diverticulitis (62%), and its most common site is the sigmoid colon (63%).10, 11 Although there have been no publications dealing with colonic perforation with the interposition of an artificial vascular graft, overall mortality of colonic perforation in patients treated surgically more than 24 hours after the onset has been reported as 61%.10 Extrinsic pressure was enhanced by an implanted, donor kidney, coupled with hematoma formation around a vascular graft anastomosis. Besides, intrinsic elevation of intracolonic pressure was induced by persistent paralytic ileus. These unfavorable events might contribute to colonic circumstance susceptible to easy perforation of the sigmoid diverticula. Given our experience in this case, we emphasize (1) that intensive attention should be paid during the perioperative period; (2) when the recipient has a colonic diverticulum, the donor kidney should not be placed in the left iliac space; and (3), when the donor’s renal vein is short, alternative vascular reconstruction strategy should be borne in mind, especially when placing the donor kidney deep in the left iliac space. Takahashi K, Saito K, Takahara S, et al Excellent long-term outcome of ABO-incompatible living donor kidney transplantation in Japan. Am J Transplant. 2004;4(7):1089-1096. Futagawa Y, Terasaki PI. ABO incompatible kidney transplantation - an analysis of UNOS Registry data. Clin Transplant. 2006;20(1):122-126. Simforoosh N, Aminsharifi A, Tabibi A, Fattahi M, Mahmoodi H, Tavakoli M. Right laparoscopic donor nephrectomy and the use of inverted kidney transplantation: an alternative technique. BJU Int. 2007;100(6):1347-1350. Kamel MH, Thomas AA, Mohan P, Hickey DP. 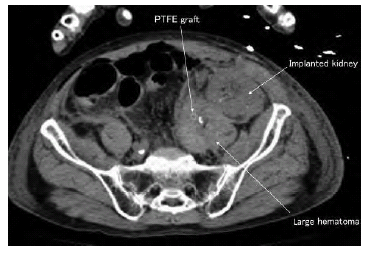 Renal vessel reconstruction in kidney transplantation using a polytetrafluoroethylene (PTFE) vascular graft. Nephrol Dial Transplant. 2007;22(4):1030-1032. Blacklock AR, Raabe AL, Lam FT. Renal auto-transplantation with interposed PTFE arterial graft: not necessarily a cure for loin pain/haematuria syndrome. J R Coll Surg Edinb. 1999;44(2):134. Mohan P, Murphy DM, Counihan A, Cunningham P, Hickey DP. The role of intraoperative heparin in cyclosporine treated cadaveric renal transplant recipients. J Urol. 1999;162(3 Pt 1):682-684. Delpín ES. Brief report: successful extension of the transplant renal vein with a synthetic vascular graft. Bol Asoc Med P R. 1997;89(10-12):206-207. Erratum in: Bol Assoc Med P R. 1998;90(1-3):4. Delpín S [corrected to Delpín ES]. Penny MJ, Nankivell BJ, Disney AP, Byth K, Chapman JR. Renal graft thrombosis. A survey of 134 consecutive cases. Transplantation. 1994;58(5):565-569. Jordan ML, Cook GT, Cardella CJ. Ten years of experience with vascular complications in renal transplantation. J Urol. 1982;128(4):689-692. Konishi T, Watanabe T, Kitayama J, et al. Successfully treated idiopathic rectosigmoid perforation 7 years after renal transplantation. J Gastroenterol. 2004;39(5):484-489. Stelzner M, Vlahakos DV, Milford EL, Tilney NL. Colonic perforations after renal transplantation. J Am Coll Surg. 1997;184(1):63-69. Toogood GJ, Gillespie PH, Gujral S, et al. Cytomegalovirus infection and colonic perforation in renal transplant patients. Transpl Int. 1996;9(3):248-251. Figure 1. Computed tomography scan 6 days after surgery showing a large hematoma around the artificial vascular graft. Figure 3. On the 46th day after surgery, axial (A) and sagittal (B) computed tomography scans show the persistent hematoma around the artificial vascular graft with no evidence of other sites of infection.